On I went into New México, Land of Enchantment. Stopped at the state line for a break, to see the Welcome Center and get maps. It had a large area with picnic shelters, and visitors are welcome to overnight for free. But, I continued on to Las Cruces. Two exits west on I-10 took me to a Walmart for resupply, to get gas and to have lunch. Gas was 22 cents per gallon cheaper than in Van Horn TX. There are lots of interesting places to visit around the states second largest city. But, not this time. I was trying to make the next camp before 4pm. 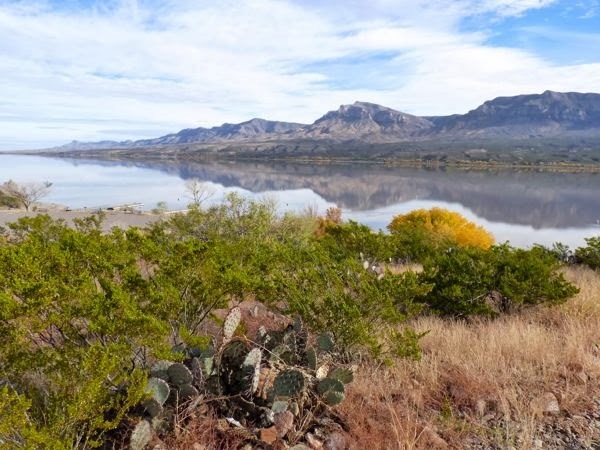 A half hour north got me to Leasburg Dam State Park along the Río Grande. 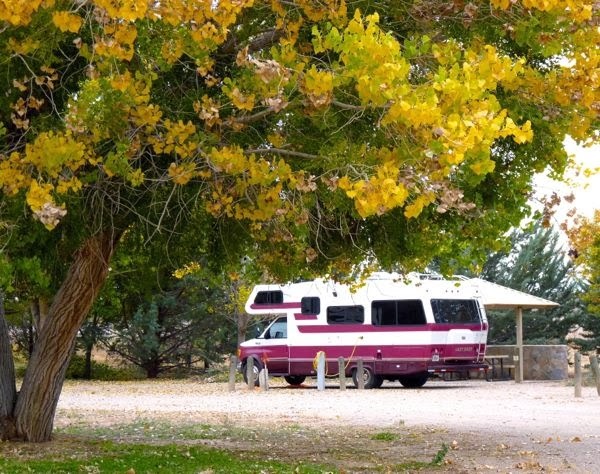 It sets on a bluff above the river, and has two camping loops with hookups and shelters. However, I chose the dry camping area and was all by myself at $8 for the night. A few short and easy trails beckoned me to hike and take some photos. Out into the desert I went along a ridge that overlooked the Río Grande. Unfortunately, the river is close to dry at this location. 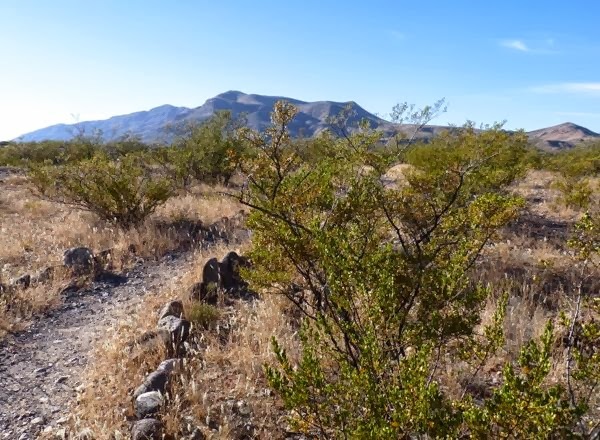 The trail took me past sage, creosote brush, and mesquite, with a few cholla and prickly pear cactus thrown in. Another hour north took me to Percha Dam State Park. Unfortunately there was no water going over the dam. I found a decent site with a shelter, electric and water for the night at $14. It was forecast to get colder overnight, so I thought power might be helpful. It was a smaller park, so there were no hiking trails. But, there was some pretty fall scenery, and it was a quiet place. Just another stopover toward a rendezvous which was only seven miles north. 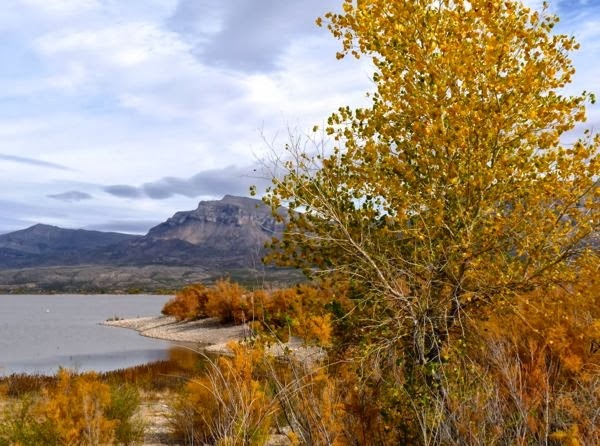 Caballo Lake State Park is situated on a bluff overlooking the lake with mountains on the other side. It’s a really pretty location, and I got a site with a great view. Again, it had a shelter with picnic table and fire ring, electric and water for $14 per night. Here is where I met up with Andy. He has been a great help to me when preparing to undertake the plein air journey, and selecting a rig. 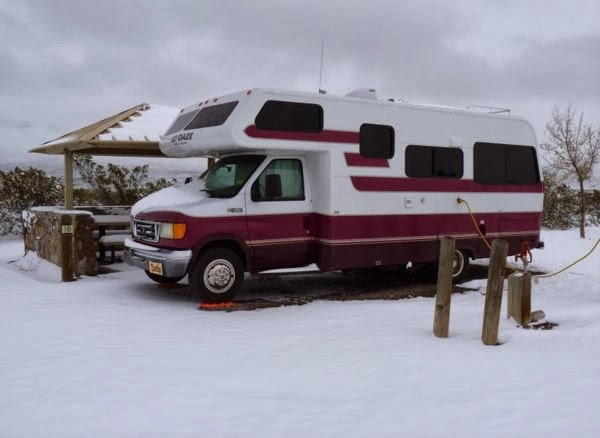 His Travels with Andy website is a great resource for anyone interested in RVing. As usual, he was generous in sharing tips and his experience. It snowed on Tardis two nights in a row with about 3 or 4 inches on the ground. Not what I planned for when coming to the southwest. But, I rather enjoyed it and the snow was gone in two days. Low temps were not a problem as it was easy to heat Tardis with the electric heat strip in the AC, and a small portable electric space heater. After a week at this very nice park, we headed north to another camp in preparation for Thanksgiving week. I followed Andy as he pointed out useful places, like a post office, a place to get propane, and a store. He loaned me one of his two-way radios which made communicating easy. And, before long we had arrived. Brrrrrrrrrr……..I find my heat strip doesn’t work like I feel it should. I thought that for awhile; but, think I may have figured it out. Check your mail for my idea. Thanks for reading my blog.